Seminar Series: "Ancient vestiges or recent innovations: evidence from click words with a shared occurrence in Khoesan and Bantu languages of southern Africa"
It is presently received wisdom that the click consonants in various Bantu languages of southern Africa reflect an uptake from a supposedly pre-existing substrate of Khoesan languages. The clicks in the latter very diverse languages are widely assumed to be of longstanding existence, and are postulated as original segments in current reconstructions for certain Khoesan families. However: this paper reveals the presence throughout the Khoesan language families of click-initial words with a demonstrably Bantu-intrinsic identity. Successive sets are presented, and regularly repeated correlations are identified. Since many of these words have roots reconstructed for Proto-Bantu, it is possible to characterise the pathways by which various clicks have evidently emerged. These formulations even have a predictive power, in that they can in some cases also account for Khoesan words without click counterparts in a Bantu language. The main discussion suggests various scenarios that might account for this previously unrecognised phenomenon, including the possibility that the various Khoesan language groups have perhaps descended from regional Bantu languages, and are therefore related not only to the latter but also to one another, even if perhaps as cousins rather than as sisters. (There is little evidence to support popular beliefs that the Khoesan languages are ‘ancient’, and that speakers of various early Bantu languages only entered the southern part of Africa in relatively recent times.) Although this paper is largely confined to demonstrating the abstract patterns that suggest these relationships, the evidence nevertheless points towards an actual mechanism likely to have been involved in the generation of clicks in both Bantu and Khoesan languages. Wider implications of the findings are noted, not only for African linguistics but also for other disciplines such as archaeology and history. Future research directions are identified. The Linguistics Program is excited to welcome Assistant Professor Fabiola Henri to its faculty! New Faculty 2014: Meet Fabiola Henri by UK College of Arts & Sciences is licensed under a Creative Commons Attribution-NonCommercial-ShareAlike 4.0 International License. Linguistics Seminar: "Embodiment and Competition: Two Factors in the Organization of Languages"
For decades, many linguists have framed the study of language in terms of a language faculty, a specialized cognitive ‘organ’ unique to humans. 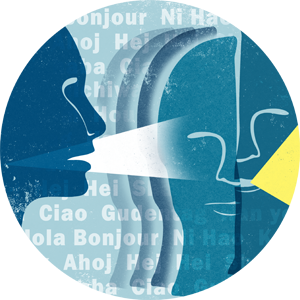 In the last decade, even the most stalwart proponents of this view have come to acknowledge the existence of other factors in the organization of human languages. In this talk, I will concentrate on two of these factors, embodiment and competition, drawing examples from the morphology of spoken and signed languages. Neither is unique to language, nor especially human or cognitive in nature. Their role in the structuring of languages points to a new research paradigm in the study of language, in which no single factor is privileged and the importance of any one of them is gauged only by the insights it provided, not by its uniqueness to language. Public Lecture: "Sign Languages of Israel"
Israel is a microcosm of the sign language world. Within a country about equal in area to New Jersey, Israel contains both a widely dispersed deaf community sign language used in schools, Israeli Sign Language, and a number of much smaller village sign languages, each confined to a single community and used only within its confines. Our research team was formed to study Israeli Sign Language, but we have also spent the last decade studying and documenting the sign language of the Bedouin village of Al-Sayyid, located near Be’er Sheva, the ancestral home of Abraham. I will compare the history and structure of these two languages and show how the study of their emergence has provided a variety of insights into language and human nature. The Linguistics Program is excited to welcome Assistant Professor Andrew Byrd to its faculty! New Faculty 2014: Meet Andrew Byrd by UK College of Arts & Sciences is licensed under a Creative Commons Attribution-NonCommercial-ShareAlike 4.0 International License.